Done With Men - A Rose Is A Rose Is A Rose! The Blurb : Travel journo, Kairavi Krishna (Kay) has had it with men. After a series of disasters (losers, philanderers, leeches, mama’s boys and possessive psychos), she is all too tempted to walk out on the prospect of ever finding love. Accompanied by her best friend and flat-mate Baani, she sets off for Goa, hoping to get away from her miserable love life and vowing to stay clear of the male species. I started reading this book one afternoon and got up only when I finished reading it, which was in a couple of hours. All through these few hours I was smiling or laughing out loud. The book got my attention as soon as I read the first acknowledgement and when I moved to the first line of the story, I was hooked. The book is written in an easy conversational style and is witty, humorous and such a fun read. The plot is well woven with a lot of twists and unexpected turn of events. The language is simple and the narrative flows smoothly and effortlessly. There is not a single dull moment in the story as the bold, confident and daring adventures of the quirky and charming Kay kept me entertained and glued to the book. 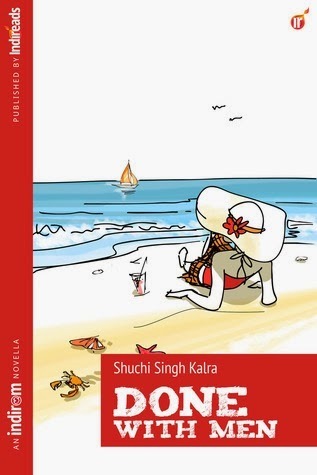 Overall, Done with Men is a fantastic debut novel and is definitely a must read if you are looking for a refreshing, light, fun, breezy rom-com. Have only seen positive reviews so far of this one. will check it out. Sounds interesting! You don’t find many books you finish off in one sitting these days! Light, refreshing, breezy, fun read — works for me :). Go for it, then Rachna!! 🙂 And so share your review. Very apt review Shilpa. It’s a short sweet read. Thanks for the nice review. Will read this one. and yes, I’m enjoying it immensely! seems like a good read and a good review too.